Nicholas stopped speaking after The Very Bad Thing happened. His mother is gone and he now lives with his Very Nice Aunt. His aunt lives in a small cottage and never pushes him to do things he doesn't want to do. She walks him to school and to his therapist because she knows Nicholas doesn't like to be out on the streets by himself. One day when Nicholas and his aunt are on their way to the store they spot a dog on the street looking up to the sky. This dog looks like he's a stray. When Nicholas speaks to the dog in his mind the dog answers back. It turns out they have a special bond and a telepathic connection. Mikey, the dog, follows Nicholas and his aunt back to their house. He then helps Nicholas to overcome his fears one step at a time. When they see The Man That Did The Very Bad Thing Nicholas and Mikey are doing everything they can to get him arrested. The Dog with the Golden Eyes is a story full of suspense, which is perfect for kids. L.M. Kay's writing style is exactly right for children. She uses words that they would use and the story is perfectly understandable even though situations and people are not mentioned by name. I loved the fact that a boy who doesn't speak formed a special connection with a dog. Having a young child and a dog myself I could easily relate to the bond children have with animals. The fact that the story also evolves around Christmas made it even more enjoyable to read. I can imagine reading this book together with my son when he is a bit older. If you're looking for a suitable book for your child I would highly recommend The Dog with the Golden Eyes. I think it would be a perfect gift for Christmas. L.M. Kay is a pen-name of Lesley Tither, who also writes adult crime fiction under the pen-name L.M. Krier. 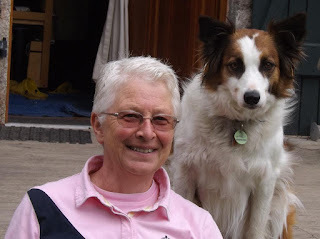 She lives in France with her two border collies, Fleur and Rosie. 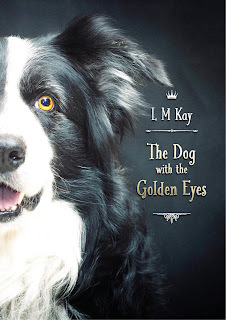 One very lucky winner will receive a signed paperback of The Dog with the Golden Eyes by L.M. Kay. I have a little dark brown-eyed girl, Billie, who's a cross between a dachshund and Australian silky terrier. She's very shy and doesn't like me to be out of her sight which sometimes makes life a bit tricky! Sprocker (A Working Cocker with a working Springer). Sophie is very energetic and has beautiful brown/orange eyes. She is very loving, funny and a little bit naughty! My dog's name is Astro and he has brown eyes. I have a black labrador cross (with a Rottie, we think. We aren't too sure). He has brown eyes like a pair of maltesers. :) It's his first Christmas with us as we got him on 29 December last year. Phoebe the Yorkshire Terrorist and she has brown eyes! Bobby, a Yorkshire Terrier. His eyes are brown. My dog is named "Piper" and she has brown eyes. I have two cocker spaniels. The boy dog, his name is Mr. Pibbs, is the father about 8 yrs old. His color is white white buff marking. He acts younger then his daughter and full of love and cuddles. :) The second one is a girl, her name is Vanilla Coke, and she is around 4 1/2 years old. She is spoiled rotten but smart as a wip. The both are my shadows. And are part of the family as fur-people. I don't have a dog. The closest I got to own one was when my boyfriend had one: a black cocker spaniel with dark black eyes. I loved her so much...she? Didn't like me that much, but got used to me eventually! I don't have a dog, however the dog I had growing up was black & had dark eyes.